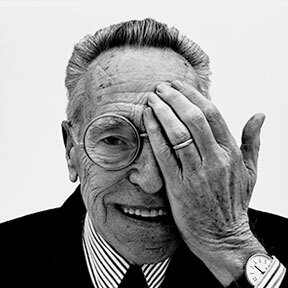 Achille Castiglioni was born in Milan in 1918. As early as 1940 he dedicated himself to testing industrial production with brothers Livio (1911-1979) and Pier Giacomo (1913-1968). After graduating in architecture in 1944, he began research into shapes, techniques and new materials, aimed at developing an integral design process. He was one of the founders of ADI in 1956. In 1969, he was authorized by the Ministry of Education to teach "Artistic Design for Industry" and was a professor at Turin's Faculty of Architecture until 1980 and then professor of "Industrial Design" in Milan until 1993. In 1987, he received an Honorary Degree from the Royal College of Art (London). He won numerous awards including 9 Compasso d'Oro awards. Achille Castiglioni died in 2002.